Everyone loves free stuff and we’re no exception to that, so we were inspired to create this post. This is an amazing city; there are tonnes of things to do in Beijing in your free time away from learning mandarin and working. If you’re on a tight budget this will be especially useful, and if not then hopefully we can encourage you to try something new. If you’re expecting us to write something like go to Tian’anmen Square at night (which could be fun with right company) or other touristy things, then you’re in the wrong place! This guide is an insider’s view on what to do in Beijing in the evenings once you’re done with all the sightseeing. If you’re an expat working here and you’re looking for some fun evening things to do in Beijing then you might want to spend a quiet Sunday listening to some live jazz at Modernista. This hutong (for those that don’t know, small traditional Chinese alleyways) bar/restaurant offers yummy food, cocktails that won’t leave you with too bad of a hangover and the prices are not cosmic. The place has a warm atmosphere and different live bands playing almost every day of the week. Its Hutong location gives it a real China feel. I’d call it a real Beijing Hutong gem. If you’re looking for an impressive place to be little bit more fancy that usual but with quality music then you might want to check out Centro, a bar located in the Kerry hotel. Entrance is free and they have a top new band that plays everything from chart toppers to classics hits. They play nearly every night except for Sundays. The price range is pretty similar to all hotel bars, for example a cocktail will cost around 100 RMB. If you feel like trying something less fancy then we’d recommend trying Qmex in Sanlitun South. They have great deals on selected meals from Monday to Thursday, our favourites are their half price burritos and pizzas. Migas Mercado is the newest trending restaurant in Beijing’s CBD area with a bit of a pricey menu. If you’re not a fan of Spanish cuisine, then no problem as Migas offers free Kizomba lessons every Tuesday night from 9pm. I’ve personally been to few of their classes and assure you that even if you’re not into Latin dancing it is still a lot of fun. You’ll meet plenty of new people and will generally have a great time be it just watching or dancing with different partners all night long. They also offer happy hour every day from 3-7 pm on cocktails and wine, just 35 RMB/glass. Nice view on a CCTV is a complimentary. 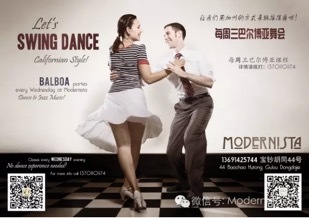 Another event that will help you shake it up is Modernista’s Swing dance night. Dancing starts at 8:30pm and it’s the perfect opportunity to get into the 1930’s vintage atmosphere. If you’re not a fan of dancing Swing then you might be interested in visiting Arrow Factory Brewing in Liangmahe. The location is great, as it’s very quiet but still at the heart of the city’s nightlife just in case you want to move on from there. On Thursday night we suggest you try something new like Georgian food. Even if you have tried it before we’re sure you’d love the great location of the restaurant Georgia’s Feast. It has a beautiful atmosphere and the staff are nice and friendly. The ladies might want to try out the cocktails; 50 RMB and they have a selection of 10 different ones. Thursday is known to be a small Friday, so right after finishing your ten cocktails you might want to check out some of Beijing’s clubs. The newest and biggest club is 1/3. You’ll meet lots of students here getting drunk for free and having time of their lives, definitely worth a watch. Another addition to Beijing’s night life is a new bar at the Intercontinental hotel named Char. With its Cuban DJ that plays almost anything but often slips into a Caribbean mood, you won’t regret spending a night dancing here. If you’re not much of a dancer than you might enjoy listening to live jazz at Good Bait, which is right opposite from the Intercontinental. The bar offers a nice atmosphere and great deal on Whisky. 6-9 pm is all happy hour, buy one get one free on all whiskey bottles plus you get your soda for free. Since Saturday is a day off you may want to culturally enlighten yourself by visiting the many Art Galleries in 798. The area also has lots of nice restaurants and shops. Most of the galleries are free of charge or cost 2-10 RMB to enter, which makes it great if you’re looking to do some sightseeing on a budget. 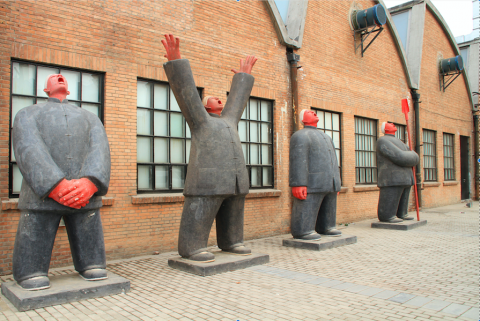 Once you’re done wandering the gallery scene, head over to Sanlitun South to enjoy a beer in a bar called The Local. It offers great a variety of beers, yummy snacks and happy hour. The pool table there is complimentary. 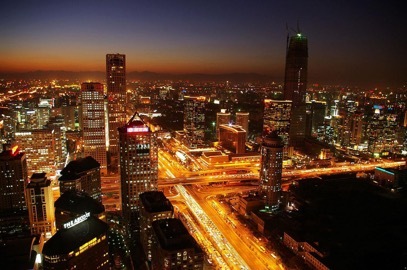 Beijing is a huge city, there are endless sights to see and many of them you can enjoy for free. So no matter what they day, or the weather there is always something to take your breath away! Rather than us give you another list, we’ll hand over to our friends at All The Rooms who have given their favourite Beijing Skyline’s you must see! We’ve also written several blogs about life in Beijing, such as our Hidden Gems in Beijing blog with more recommendations for fun things to do in Beijing. Please feel free to visit!